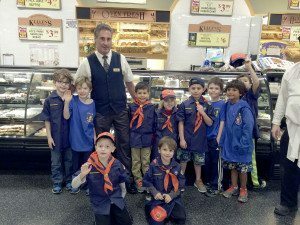 Munsey Park Cub Scout Pack #3’s Tiger Den went on a trip to the Manhasset King Kullen store for a nutrition tour. Store Manager Jerry Reilly brought the boys to the different store departments, including produce, fish and bakery, where they got to go home with a healthy treat. The Scouts learned about healthy eating habits and recycling.